It seems that Brother knows no boundary when it comes to offering super affordable sewing machines packed with features. Just when we thought that another Brother was the One to hail as the top beginner machine, Brother sewing machine XM2701 takes the cake. It doesn’t take much to figure out why it garnered the coveted ‘Amazon’s Choice’ label, but this Brother XM2710 review will expound on how they achieved this amazing balance of price and features. Moderate range of 27 stitches, of which you have decorative, stretch, zigzag, and blind hem. Fully automatic buttonholes, which means it is done within a one-step process. Fully automatic bobbin winding mechanism. Fully automatic needle threading. They call it ‘easy threading system’ because all you have to do is press the side lever to lineup the needle with the thread. Quick-Set top drop-in bobbin, having jam-resistant quality. Built-in free arm for sewing pant legs, shirt sleeves, and cuffs with ease. The XM2701 sewing machine comes with a standard 25-year limited warranty. Although the very low price tag screams ‘beginner’ and ‘entry’, it is nonetheless a sewing machine with a broad reach that even experienced sewer can benefit from. The first thing you will notice when you turn it on is its smooth, quiet operation. That is, relatively quiet when compared to other models and brands. This makes it comfortable for long hours of work, without inducing a headache due to all the ratcheting. If you are transitioning from a sewing machine you’ve had for a decade or more, you will be impressed with the current technological standard. 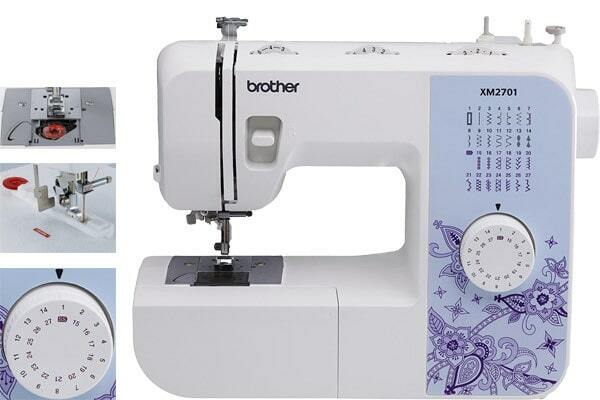 Brother XM2701 is by no means a computerized sewing machine. However, it does have essential automatic features that you can find in such more expensive machines and it is one of the top sewing machines for children (click here to see the list). The most important of these are no-effort, one-step buttonholes, and also effortless needle threading which is implemented with a simple push of a button/lever. Unfortunately, this does not extend to automatic thread cutting, but then you would have it in a higher class than the price calls for. Most importantly, of the 27 built-in stitches, you have a mix of everything that a sewer would need barring the more advanced runaway-grade projects and multilayered handling of tough fabrics. As such, working with XM2701 extends your sewing project reach to: repair, new clothes making, quilting, decorative layering, and the aforementioned effortless buttonholes. To top it off in the convenience department, the automatic bobbin system winds with the so called ‘Quick-Set’ system, which basically means that it is highly resistant to jamming and it stays where it should during the machine’s operation. You control the automatic bobbin system with the right side button in mere seconds. One could easily make the case that analog dials are better than LCD screens for operating a sewing machine, especially with those models that don’t have a huge number of stitches. When you have a dial, you are more efficient, as it is quicker to cycle through any option and select any stitch. Speaking of which, all 27 stitch options are clearly illustrated on the machine itself, just above the clearly numbered dial. As you might have noticed, the accessories at this price point are very generous. Alongside the standard ones required for maintenance and to get you started, with Brother XM2701 you get multiple feet pressers. Each one fitting a different project: zigzag, zipper, narrow hemmer, button-fitting, buttonhole-sewing, and blind stitch. Not so long ago you had to buy additional feet pressers, so it’s great to see that this is becoming a standard offer, no matter the price class. Even some advanced, far more expensive sewing machines have not only poor lighting, but using last-gen incandescent light bulbs which heat up and burn out within a few months. This is not the case with XM2701 as it uses appropriately bright, cold, and durable LED lighting. No matter what kind of lighting you have in a room, due to random shadows everywhere, it is a necessity to always have a focused lighting present while you work. The integrated LED light serves this purpose without fault. Should one even take account of downsides for a sewing machine this cheap and offering so much? Wouldn’t that be quite silly? Of course, you would have to if the basic features didn’t work, but this is not even close to truth here. In fact, all you have to object to is its expected inability to deal with heavy fabrics like denim and leather. But no one marketed Brother XM2701 as a heavy duty anyway. This merely serves as a notice to not fool yourself into thinking that you will be successful in using this machine for those applications. For everything else, you are good to go. Brother clearly has a mission, just like with their printer and scanner lineups, to nurture a growing ecosystem of exceedingly affordable and competent hardware. In lieu of this, the XM2701 is almost too good to be true. You can use it to tackle most projects with ease, it is comfortable to use thanks to its low noise level, its lightweight makes it portable and easy to store, and its control scheme is very intuitive, especially when coupled with appropriate presser feet. What more could you want for such pittance of a price?